Bothiel, a Bosmer mage, is a Wizard of the Mages Guild. She is also an astronomer and the curator of the Orrery. However, you must have the Orrery official plug-in installed for her to offer you the related quest. 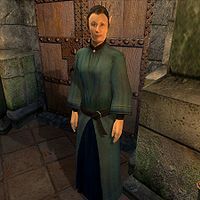 During the Mages Guild quest she will provide you with a note that might offer you a clue to unveil the mystery of the Necromancers. Bothiel surely must be one of the NPCs that spend the longest time in bed: a record sixteen hours. She goes to sleep at 6pm in the Mages Quarters and is supposed to wake up at midnight. Unfortunately, due to a bug, she sleeps through the whole night, until 10am of the next morning. From then onward she will be found in the Arch-Mage's Lobby, either wandering around or sitting on the bench, until it's time to sleep again. With the Orrery plug-in installed, she will abandon her usual schedule to sit on a bench in the Arch-Mage's Lobby and wait for you to retrieve the Dwarven artifacts. When you return the artifacts to her, she will enter the Orrery and stand beside the console for a full 24 hours to repair it. After she fixes the Orrery, but before you activate it, she will no longer spend as much time in bed, as she now wakes up at the correct time to visit the Orrery for ten hours. She was supposed to leave the Orrery at 8am, but due to the same bug mentioned above she stays for an extra two hours. Once the quest is finished she will return to her usual sleepy routine. Her attire is peculiar in that, apart from the standard mage's robe, she also carries two pairs of shoes: middle-class pigskin shoes and upper-class gold trimmed shoes. Her only other possession is a leveled amount of gold. She doesn't wield any weapons, relying instead on a set of leveled spells from all of the magical schools except Illusion and Mysticism. Inquiring about the Imperial City reveals her obsession over the Orrery: "The orrery here is the only one in Cyrodiil. There's one more in Hammerfell... the old one at Stros M'Kai." During the Necromancer's Moon quest, Raminus will point you her way: "Hmm. I have never heard of this 'Shade of the Revenant.' Some sort of celestial phenomenon? If that's correct, then Bothiel would be most likely to know something about it, as the caretaker of the Orrery. She should be on University grounds." If you press him on the Orrey he'll reveal: "A most fascinating contraption. Bothiel is one of the few who understands how it worked, and kept it running." If you then ask her about the Shadow of the Revenant, she will say: "Revenant, you say? And it represents something in the Heavens? It sounds familiar. Let me think... Ah, yes! Now I remember! Falcar was here some time ago, asking about just such a thing. Said it was for research. He had a large sheaf of notes with him about it. I'm afraid I didn't have any more advice for him than I do for you. With the Orrery in such a state of disrepair, I have no point of reference. Falcar did leave this behind; I think it fell from his notes as he left. I didn't pay it much attention, but perhaps it will be of use to you." At which point she will hand you over the hastily scrawled note. If asked about Necromancers she will reveal that she knows little of their activity: "I've heard things, to be sure, but I don't really know anything about them. Is it true that some of our guildmates were killed? Oh, how horrible!" With the Orrery plug-in installed, she will have a bit more to say. When you speak to her for the first time before you recover the artifacts, she will greet you with: "I'll pay handsomely if you can procure the items on that list. Find me everything on there, and you'll be well compensated. Good day." Should you talk to her again, she will say: "It's... It's nice to see you too, but you're a bit empty-handed, aren't you? Remember those items we talked about? Please, I'm still waiting..." When you give her the artifacts, she will respond with: "You have them? The items I requested? Give them to me, please! Yes... yes, this seems to be everything. Here's your reward. Thank you again!" Now that the Orrery can be accessed, it is also possible to hear her unique greeting should you meet her inside: "Welcome to the Orrery. I'm Bothiel, and the Orrery is my baby." She holds ownership over the key-requiring door that leads from the Lobby to the Orrery. This is why it is one of the few locations in the University campus where entering will count as trespassing. Bothiel's sleeping package, BothielSleep18x6, would imply that she wakes up at midnight. However, she has no AI packages between that time and 10am, and she will therefore continue doing her current action; which in this case is sleeping. It is possible for Bothiel to disappear indefinitely into inaccessible areas. This seems to occur particularly if you are doing both of her related quests (Repairing the Orrery and Necromancer's Moon) at the same time. 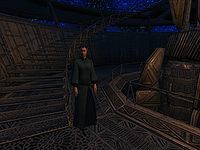 One known solution is to uninstall the Repairing the Orrery plug-in; within 24 hours Bothiel should reappear in the Arch-Mage's Lobby. Complete Necromancer's Moon, then reinstall the plug-in. If this happens when Necromancer's Moon isn't active, then uninstall the plug-in, go to the Arch-Mage's Lobby and wait for her to appear. Once she does, save your game, then reinstall the plug-in and you should be able to complete the plug-in's quest. This page was last modified on 20 May 2018, at 20:02.